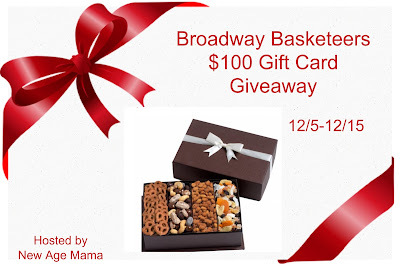 If you're looking for a gift for someone special in your life, consider the beautiful items at Broadway Basketeers. You can choose from baskets, towers, and fun samplers that are filled with tasty goodies that are sure to make anyone smile. They even offer a selection of flower bouquets. This is truly a one-stop shop for all your gifting needs. Here are just a few examples of the gits you can find at Broadway Basketeers this holiday season, all available at affordable prices. If you'd like to learn more about Broadway Basketeers and all they have to offer, be sure to visit their website. To keep up with new products and promotions, follow them via their social media. With the holidays right around the corner, you won't want to miss out on all these fabulous gift ideas. One lucky winner is going to receive a $100 Gift Card to Broadway Basketeers! To enter, just fill in the Giveaway Tools form below. This giveaway will 12/15/16 and is open to the US only. The winner will be notified via email and will have 48 hours to reply. Thanks again to the the sponsor for offering this fantastic prize. I love the Grand Gourmet Gift Basket. Nom Nom! I love the Gourmet Holiday Gift Basket. All of their items look great though! My favorite product is the triple chocolate cheesecake. I would love to get the Vanilla Birthday Cake for my daughters birthday coming up! I would love the Deluxe Gourmet Chocolate, Sweets, and Nuts Gift Basket! Cheese cake..offerings..any and all! My fave.